English astronomer; born at Hanover Nov. 15, 1738; died at Slough, near Windsor, England, Aug. 22, 1822. His Jewish descent is acknowledged by his biographer, Holden, and it is also indicated by the fact that his grandfather was named Abraham, his father Isaac, and his eldest brother Jacob. 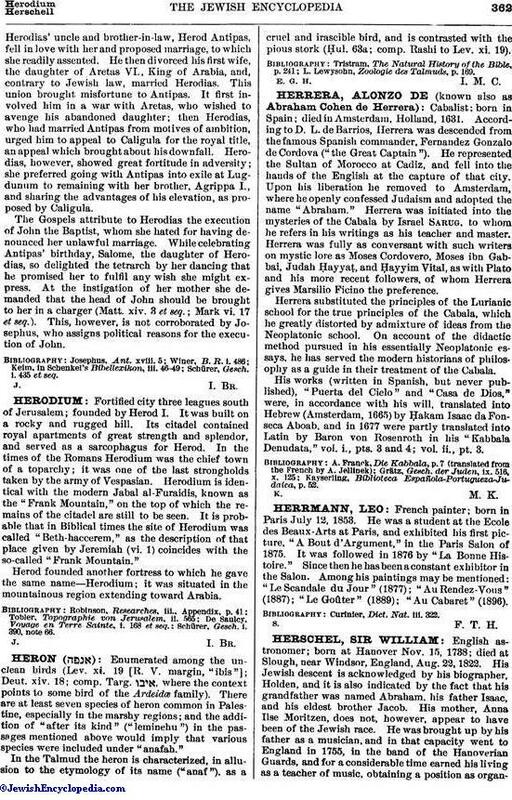 His mother, Anna Ilse Moritzen, does not, however, appear to have been of the Jewish race. He was brought up by his father as a musician, and in that capacity went to England in 1755, in the band of the Hanoverian Guards, and for a considerable time earned his living as a teacher of music, obtaining a position as organistat Bath in 1760. Meanwhile, however, he was devoting all his spare time to the study of astronomy and the making of telescopes. By the aid of one of his larger instruments he discovered the planet Uranus, March 18, 1781, and at once obtained a permanent position in the world of science, being appointed astronomer to the king. He was made an honorary member of most of the scientific societies of Europe. Herschel's researches mark an epoch in modern astronomy. He was practically the founder of side-real science, and made a complete review of the northern heavens three times, fixing the positions of 2,500 nebulæ, of which 203 had hitherto been unknown. He was also the first to conjecture the existence of binary stars, of which he identified and described no less than 209. He determined the elements of Saturn more fully than had previously been done, and above all he was the first to throw light upon the constitution of the Milky Way and its relation to the universe in general. His views on the position of the solar system in relation to the Milky Way still form the central factor in the modern theory as to the constitution of the universe. He is also known as the discoverer of the infra-red solar rays. In his review of the heavens he was assisted by his sister, Caroline Lucretia, born at Hanover March 16, 1750; died there Jan. 9, 1848. She read to him, took notes, and at times even fed him while his hands were engaged with telescopic work. She herself was no insignificant observer; she discovered no less than eight comets, and in 1828 received the Astronomical Society's medal for a catalogue of nebulæ. 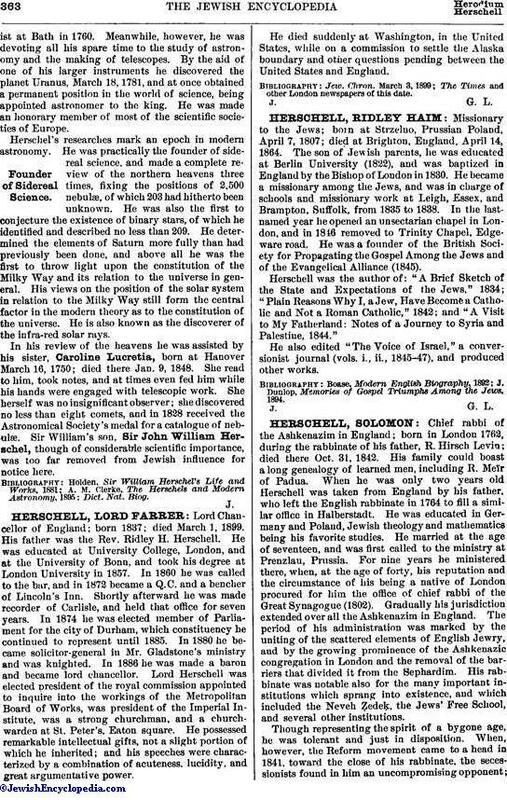 Sir William's son, Sir John William Herschel, though of considerable scientific importance, was too far removed from Jewish influence for notice here.